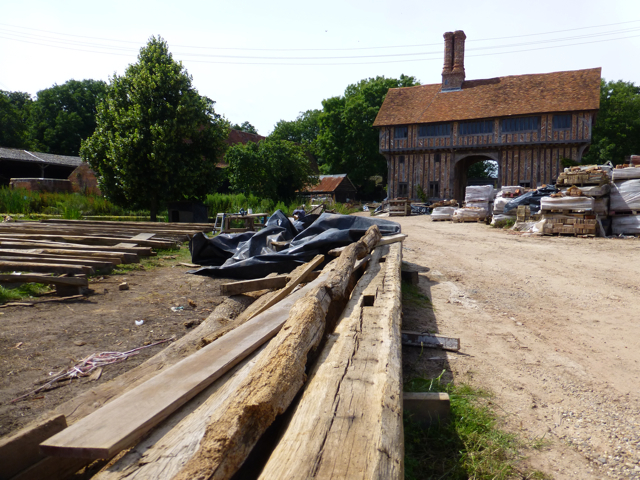 A Suffolk reclamation yard north of where we live and not too many miles from the sea. The owners specialise in dismantling old unwanted barns and rebuilding them. The timbers in the pic are there for a barn in mid reconstruct. afterwail of builders. Rubble, sand piles and broken glass. The house is little, old and crooked and so any paving has to look as if it has been there forever. I have some old Suffolk whites but need five times as much. Old bricks of lesser quality are trading at £1.10 ex VAT. 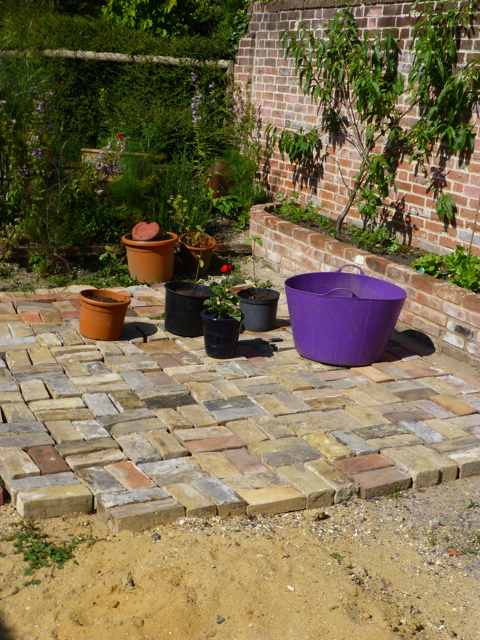 There are about 36 bricks to the square metre so that is nearly 50 quid per metre. On the drive home, Jewsons offered a price compare with round about £11 for a square metre of concrete pavers. They looked all right in the yard but laid out back home, no. The contrast between lard and President butter. Living with builders rubble may be our long term status. It could be a long old hunt. Meanwhile, below is our readymade brick collection waiting to grow. I hope you succeed in finding your bricks, I do like what you have done so far, they look really good. Reclamation yards are such interesting places to wander round, you never know what you’re going to find! Reclamation yards are becoming addictive! We found affordable handmade bricks still being made in the Forest of Dean – we bought seconds, hence affordability.Worth investigating such possibilities? Thank you Anne – good idea. I am also checking Ebay and Freecycle and will build up a stock bit by bit – swapping 2 square metres for some planting advice. I am happy to be slow.